A song from long, long ago popped into my mind this morning. The human brain is constantly storing more data-bits and when you get past sixty there’s an incredible info-cyclone swirling around up there. You may not find the name or detail you’re specifically looking for, but all kinds of other things pop up. But he has a long wait ahead. Can you name three things she pulled out of her purse while she was hunting for her keys? Our weather’s supposed to warm up in the next few days, then turn colder again. which means we’ll get icicles hanging from the eaves wherever roof snow has trickled down. 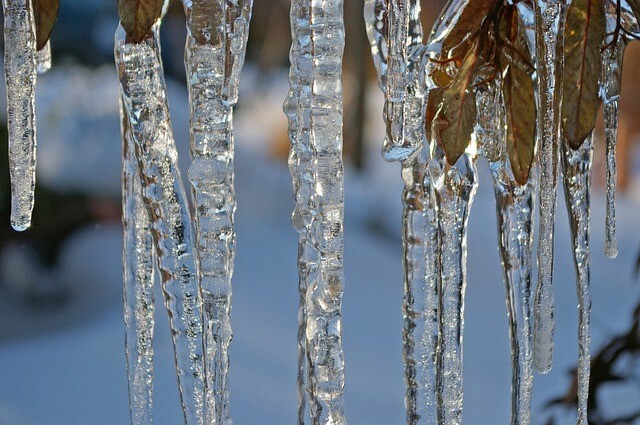 Icicle are so picturesque, don’t you think? And what child in the colder parts of the world hasn’t tried to eat an icicle? You crunched it with your teeth and loved the sensation of eating frozen glass. Who among us hasn’t broken off a particularly long one to wave around like a spear, feeling its slippery smoothness? Tossed it like a javelin and listened to the splintering sound as it hit its target. Perhaps you were wearing wooly mitts when you cracked the metre-long icicle off from the overhanging roof on a sunny day, then had your mittens freeze to the ice. When you finally were able to drop it, you found fuzzy fibers stuck to the icicle and your mitt had a thinner spot. I suppose there are places in the world where icicles never form, let along get to be six feet long. One can’t imagine them hanging down from trees in the Amazon rain-forest, or in caves along the Nile. What deprivation! On the other hand, we were in Quebec during the infamous “Enfer de glace” when steady rain for almost a week and temps hovering at the freezing point gave “ice” a whole new meaning! Likewise, what northern climate child hasn’t tried to catch a snowflake on his tongue? Or you open your mouth to the falling flakes and try to catch a dozen, feeling the tickle of cold as they land on your face, powdering your nose and hair. What child doesn’t love being out in a fresh thick blanket of snow. You swish through the whiteness, plowing it aside with your feet. Or flop down and make a snow angel. When the snow’s falling thick and fast you can look around and feel yourself all alone in this whitening world, leaving your own trail. Your own personal mark in time and place. Then you glance back and watch the snow filling in your footprints, erasing your passage, making the world white again. You get a fleeting sense of your own life story, your own mortality. The falling snow wipes out all your missteps and stumbles. Snow renews our hope that such things are possible, that we can have our missteps in this world erased by a merciful heavenly hand. Snow is created for the senses; it’s created for the bliss of an exploring child. And for a lot of folks it has this figurative sense as well: forgiveness and a life cleansed from impurity. where we were to do a post describing some aspect of the sense of touch. “Maybe.” Pearl smiled sympathetically. His mother, her Aunt Matilda, seemed too focused on bones of contention. “Chip off the old block,” Pearl murmured after the door was shut. She looked at the stacks of books in the box and thought of the two sisters, Mabel and Matilda. Each of them had her own way of looking at life; each recorded her perspective in these journals. The years had been good to Mabel and Matilda, both of them lived into their nineties before they passed away. Both women had kept journals most of their lives and after their deaths Pearl heard that all their journals were going to be destroyed. Hoping to write a family history book someday she begged permission to look through them before the grim sentence was carried out. Then her cousins decided since Pearl was the only one in the family with enough patience to pore through them, and prudent enough not to blab the contents, she could have the lot. Pearl had breathed a sigh of relief; so much information would have been lost! Now the precious books were in her hands. She carried the box to the coffee table, set it down and started sorting the collection into years. Skimming through Aunt Mabel’s slapdash version of the late 20’s, Pearl could picture her so clearly, a teenager eager for life. She smiled. Aunt Mabel would have been a flapper! It will be interesting to see how she coped during the Depression years, Pearl thought. Good thing she couldn’t see the future right then. She set 1928 down and slowly leafed through the years to 1985. At this point Mabel was widowed and lonely at times, yet enjoyed outings with her children and grandchildren. Then Pearl picked up her journal from 2000 and noted that she still found interesting little news items to report every day. Perhaps a caller popped in or she took a walk. If Mabel couldn’t get out she wrote about the weather and other things she observed from her window. Spring blossoms excited her; birds in nearby branches were noted in her books; she described in detail the trees turning color in fall. She mentioned the activities of her neighbors. She wrote with humor about the Y2K panic. Thinking back, Pearl could see again how Mabel’s eyes had twinkled when she talked about the disaster that was “going to put us all back in the stone age” and how it fizzled. Yes, that was Aunt Mabel. Always interested in life and the people around her, always ready to visit and relate humorous little stories that gave everyone a chuckle. She stayed as active as she could for as long as possible and when she was too frail to get out family members stopped in to share her good cheer. Then Pearl picked up one of Aunt Matilda’s 1990s diaries to read, but soon found herself fighting sleep. “Nothing much happened today” was the most frequent entry, coupled with complaints about the rheumatism which kept her from getting out or the fact that no one had called. Another time she complained, “Seems like whenever I do phone someone they’re quick to say they have something pressing and have to run. Folks these days are just too busy to talk.” Though Pearl was sympathetic and never contradicted, she got the feeling folks were eager to get away from Matilda’s rehash of all her woes. As elderly widows these two sisters had lived together for over fifteen years, looked out the same windows at the same changing scenes, but one had seen beauty and one had seen monotony. Pearl could remember Aunt Mabel grabbing her raincoat and umbrella, off for a walk in the rain while her sister sat by the fire with her sore joints and wouldn’t do handwork or read for fear she’d ruin her eyes. Mabel went out to search for life while Aunt Matilda expected life to come in and tickle her. Which seldom happened, sad to say. Such a shame, she thought as she closed the bleak diary. She stood up and walked over to the window, savoring the bright morning. She watched a robin dashing in and out of the sprinkler spray.